Never edit the built-in schema category definitions. When you need a custom schema (or, for HL7, when you need custom message types that contain Z-segments), create a custom schema category definition that uses a built-in schema category definition as its schema base. Be sure to perform these tasks in the same namespace that contains your production. The ASTM, EDIFACT, HL7, and X12 standards are extensible. For example, a common practice in customizing ASTM is to add custom segments to an otherwise standard ASTM document structure. Similarly, the common practice in customizing HL7 is to add custom segments to an otherwise standard HL7 message structure. By convention, the custom segments have names that begin with the letter Z (ZEK, ZPM, etc. ), so custom segments are called Z-segments. A custom message structure often consists of a standard message with a few Z-segments added to it. To create a custom HL7 schema, you can use the Custom Schema Editor as described in Using the Custom Schema Editor in the HL7 Version 2 Development Guide. In Studio, open the schema category definition that most closely meets your needs. Use File > Save As to create a new definition. Then edit the copy. The section Syntax for Schema Categories in Ensemble provides details for the syntax of the definition. Use a Studio wizard to create a new custom schema category definition, and then edit that. See Creating Custom X12 Schemas in the Ensemble X12 Development Guide. The same process can be used for ASTM, EDIFACT, and HL7. The Studio Workspace window displays a list of the schema categories in the given namespace. See the Other folder. These definitions have file extensions such as .AST, .HL7, and .X12. 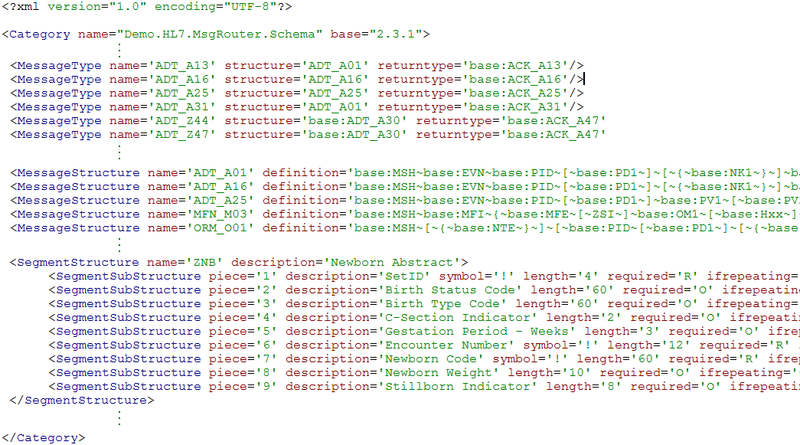 Ensemble uses the same XML-based syntax to represent schema category definitions for ASTM, EDIFACT, HL7, and X12. The following shows an example. Note that the actual text is longer and wider than the example, which contains ellipses (...) for omitted items and is truncated at right. Inside the <Category> element, the example begins with two sets of XML elements that you do not need to work with: <MessageGroup> and <MessageEvent>. These elements group HL7 messages into functional categories. The example ends with two other XML elements that you do not need to work with: <DataStructure> and <CodeTable>. These elements define the range of possible values for certain fields in certain messages. When you create a custom schema category, you supplement an existing schema by defining custom segments (Z-segments) and then stating which message types and message structures may contain those segments. To accomplish this, you only need to work with the XML elements <MessageType>, <MessageStructure>, and <SegmentStructure>. When viewed in Studio, a custom schema category definition resembles the following figure. The actual text is wider than the example, which is truncated at right. You can view the complete example by opening the schema definition file Demo.HL7.MsgRouter.Schema.HL7 in the ENSDEMO namespace. The following table describes the <Category> attributes. std When 1 (true), this <Category> block describes a standard HL7 schema category. The default is 0 (false). For standard schema category definitions only. Do not use std in a custom schema. base Identifies the schema category that is the base for this custom schema category. Every definition in the schema base is automatically included in the custom category; statements in the custom schema category simply add to the base. The name of a standard or custom schema category defined using a <Category> block in another .HL7 file or other schema file. The following table describes the <SegmentStructure> attributes. 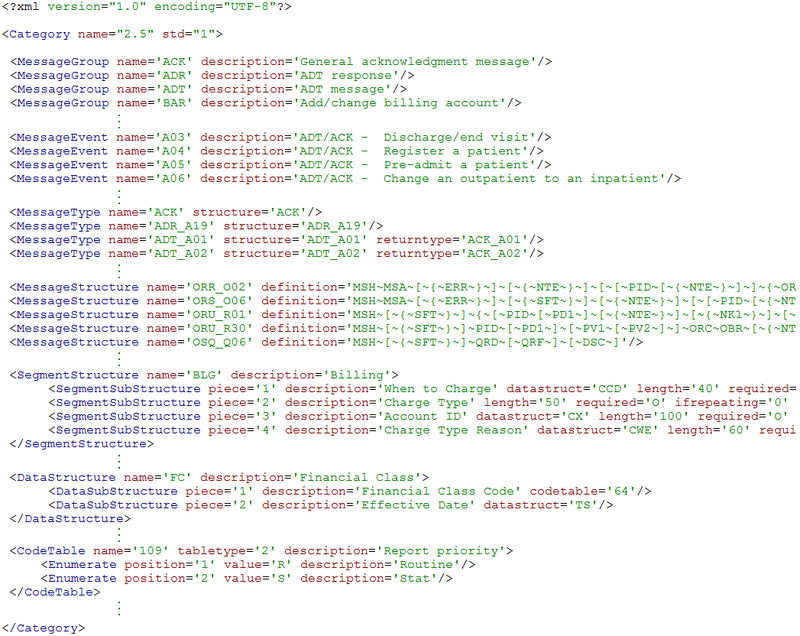 name Name displayed in the Schema Structures page in the list of available segment structures. 3character string. By convention, custom segment names begin with the letter Z. The following table describes the <SegmentSubStructure> attributes. piece Number displayed in the Schema Structures page when the user asks to view details of the segment that contains this field. This number can be used to identify the field in a virtual property path. Integer. Each <SegmentSubStructure> within a <SegmentStructure> must use piece values in sequential order, beginning at 1 and incrementing by 1.
codetable Code table that enumerates a list of valid values for this field. This attribute is typically not used in a custom schema. The name of a code table defined using a <CodeTable> block. datastruct Data structure that specifies how to interpret the values in this field. This attribute is typically not used in a custom schema. The name of a data structure defined using a <DataStructure> block. Symbol that indicates the requirements for presence, absence, or repetition of this field within the segment. This field is optional. It serves as an indicator on the Schema Structures page. It does not actually control the requirement or repetition of fields. See required and ifrepeating.
! means 1 only. The field must appear, but only once.
? means 0 or 1. The field may appear, but at most once. + means 1 or more. The field may repeat one or more times. * means 0 or more. The field may repeat zero or more times. & means the field may be present, and may repeat, but only under certain conditions. required Whether or not this field must be present in the segment. ifrepeating Whether or not this field may repeat within the segment. Integer. 0 means no, 1 means yes. The following table describes the <MessageStructure> attributes. name Name displayed in the Schema Structures page in the list of available message structures. 3character string, plus an underscore (_), plus a 3character string. So that Ensemble can find the appropriate <SegmentStructure> in the other file. No other external .HL7 file can be referenced; only the schema base. In the <MessageStructure> example at the beginning of this topic, only the ZSI segment is defined in the same .HL7 file. The other segments (MSH, MFI, MFE, OM1, and Hxx) are all defined in the schema base. The following table describes the <MessageType> attributes. name Name displayed in the Schema Structures page in the list of available message types. 3character string, plus an underscore (_), plus a 3character string. So that Ensemble can find the appropriate <MessageStructure> entries, in the .HL7 file identified by the base attribute in the containing <Category> element. No other external .HL7 file can be referenced; only the schema base. The following example uses both styles of syntax. This example defines a custom message type MFN_M03 that sends a custom MFN_M03 and receives a standard MFK_M03 as a response.